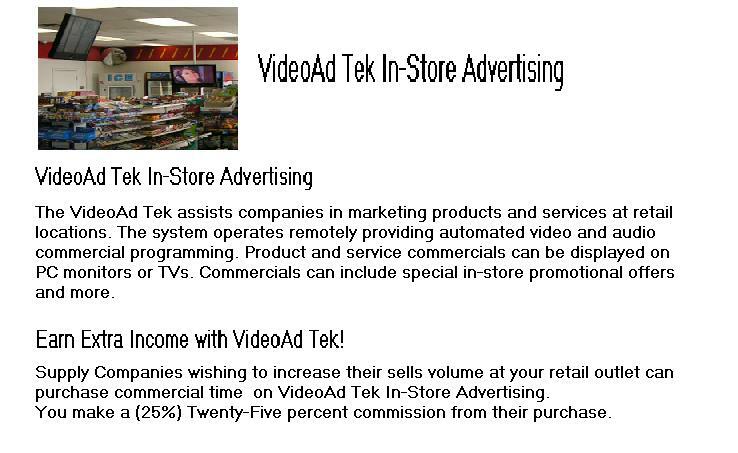 Now You Can Advertise Right Where your Customers Shop With VideoAd Tek! VideoAd Tek is a unique advertising program that gives your business on-going visibility at retail locations at a low cost. It's easy to get your business on-screen using our VideoAd Tek: In just 5 to 7 business days, we can create a ten,or thirty-second video advertisement commerial for your business, that can be broadcast on MULTIPLE - LCD VIDEO SCREENS at busy metropolitan area retail, entertainment and restaurant locations, IN FRONT OF A MULTITUDE OF CUSTOMERS EVERY MONTH. You can elect to ADVERTISE AT ANY OF OUR LOCATIONS, provided space is available. Unlike a print ad or a traditional sign or billboard, YOUR VIDEO AD CAN BE UPDATED AT ANY TIME, with your r updates typically done AT NO CHARGE. Consumers hear the same product commercials over, and over again. Commercials on VideoAd Tek will be more effective because the customer sees your commercials when they are in a retail location making a purchasing decision. Your company will sell more products to the retailers; the retailers will sell more products to the consumers, creating a winning combination! Finally! Low Cost Advertising That Makes Sense! Use our different commercial advertising packages to display your ad in one location or at any number of locations simultaneously, it is up to you! Many of our clients find it makes sense to display their ad using our 12-month package or longer, to TAKE ADVANTAGE OF OUR SUBSTANTIAL DISCOUNTS. 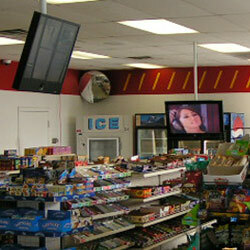 VideoAd Tek assists companies in marketing products and services at retail locations. The system operates remotely providing automated video and audio commercial programming. 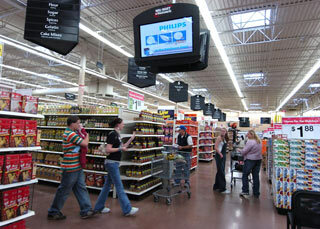 Product and service commercials can be displayed on PC monitors or TVs. Commercials can include special in-store promotional offers and more.